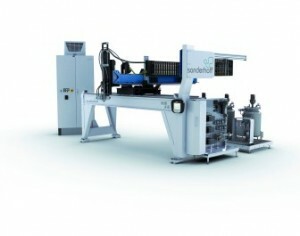 At the forth coming 15th Shanghai International Automobile Industry Exhibition (Auto Shanghai 2013), Sonderhoff will present its mixing and dosing system DM 303 with linear robot LR-HE plus in live demonstration of foam gasket applications. Its low emission sealing Fermapor K31 and transparent casting Fermadur will also be presented. The DM 303 is a three-component mixing and dosing system for gasket, gluing and potting application of different parts from various industries. The DM 303 can be used either as a module in a fully automated production line or as a stand-alone system. It can be integrated into any production concept. LR-HE plus linear robots ensure precise guidance of the mixing head of Sonderhoff low pressure mixing and dosing machines for applying polymer foam gaskets, potting compounds and adhesives onto or into parts. According to the company, one outstanding advantage of the LR-HE plus is the substantial improvement in the maximum sliding speed in the X, Y and Z axe, so that the mixing head can move along the part contours faster. At 35 meters per minute and a maximum acceleration of 5m/s² in small radii, higher output per shift is now possible for a given component geometry. Sonderhoff also announced that it received certification after intensive tests by an accredited independent test institute, that its two-component foam gasket system, Fermapor K31-A-3560-1-LE, fulfills the rigorous requirements for low emissions (low VOC and FOG values) and therefore also contribute to reduced pollution in a car. As for its Transparent casting, the Sonderhoff LED potting material is a two-component polyurethane system from its Fermadur product family that provide good mechanical properties and therefore also protection against moisture and weather. Polyurethane potting compounds for LED applications are crystal clear or opaque if desired and temperature stable up to 130°C. Auto Shanghai 2013 will be held from April 21-29 in China.